Not a lot of direction/instruction once you're into the game. Terraria is an absolutely addicting mining, building, crafting, adventuring, exploring – well, you get the point. There is so much to do in this game, and so many places to do it in. It’s loads of fun, and I highly recommend it. You’d have to be living under a rock for the last year or so to have not heard of Minecraft. The addicting low tech building game absolutely took the gaming world by storm, enchanting gamers young and old. With such a broad and seemingly universal appeal, every new game of that type that pops up is sure to be subjected to some pretty hefty comparisons, and most of them are simply not able to stack up. 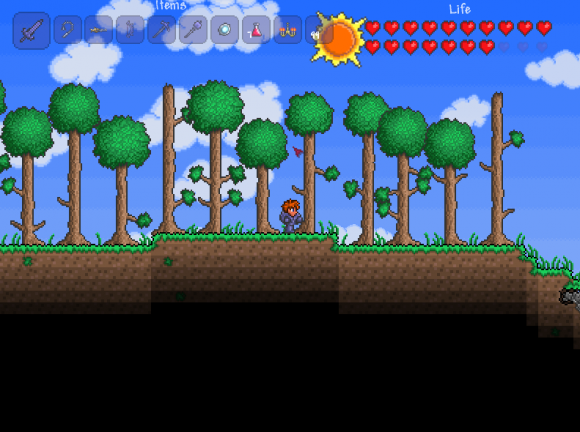 Re-Logic’s Terraria saw a lot of success on the PC, and has now been ported to consoles. Can Terraria stand as a great game on its own, or is it just another Minecraft wannabe? 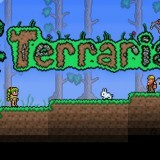 As you begin Terraria, the first thing you’ll notice is the great 8 bit graphics. It reminds me a lot of my old Nintendo days. As you being, you are given the choice between a male or female character, and a palette full of colors with which to personalize everything from hair and eyes to shirt and boots. Choose a name for your randomly generated world, and you’re on your way. 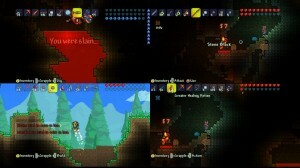 Terraria offers an optional tutorial, which is fairly brief and really a must if you are unfamiliar with the game. The tutorial walks you through the basics of mining and building a shelter, and gives you tips about getting friends to move in. Considering all there is to offer in the game, the tutorial is very basic, but it gives you enough to get you started on the right foot, and leaves the rest of it up to you to discover. Exploration and discovery are really a main facet of the game. You’ll want to traverse your world both above and below ground, gathering resources, looting pots and trunks, and of course, battling tons of monsters, from zombies and demon eyes to big, bad bosses. Like Minecraft, you will spend a lot (and I mean a lot) of time simply mining and gathering. 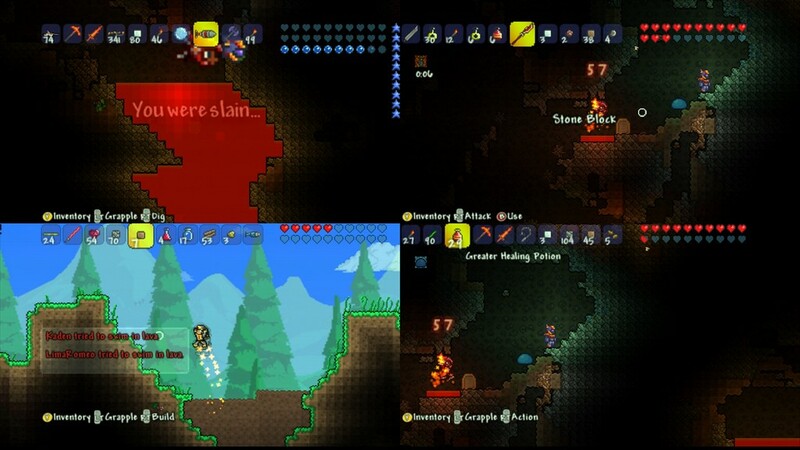 Everything from mud and trees to gold and demonite lays in the ground of Terraria, and gathering the very best resources is the best (and most fun) way to advance in the game. A hammer, axe, and pickaxe are all you need to mine everything around you, but crafting better tools makes for a lot faster digging. Crafting is a rather in depth undertaking, which becomes apparent as soon as you realize the enormous amount of materials available. You’ll want a workbench to start with, but soon you’ll add things like a furnace and anvil to craft even more stuff, and you’ll be instantly addicted to finding the rarest materials to craft the most badass weapons and tools around. Of course, with monsters everywhere, you’ll want both a safe place to craft in and friends with deep pockets, and that’s where your house comes in. As the tutorial will inform you, a sturdy dwelling place is an absolute must, preferably built before night falls on your world. In the daytime, you’ll be plagued by the occasional easy to kill slime, but at night time the real monsters come out, and sometimes you just need a place to hide like a frightened child. There are plenty of trees above ground, and taking after them with your axe will quickly net you plenty of wood to start building. Building is done by placing one brick at a time, and you can virtually build in any way you like, gravity be damned. Each element of your building, from doors to walls to torches to furniture, must first be crafted from raw materials. Building a home (or several, if you like) is a lot of fun, and allows for as much or as little customization as you like. While you’ll likely want to start small to begin with, you’ll want to expand your house as quickly as you’re able in order to allow for roommates. If you build extra rooms in your house (each complete with a table, chair, and torch), various NPC’s will move in as you advance in the game. Each of them are able to sell you very useful items, as well as buy your unwanted items for quick cash. They are kind of divas though, and each of them requires their own room, or they simply won’t move in. 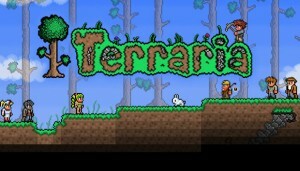 Terraria is just a game that one could go on about forever; there is just so much to do, and so much to uncover. Just when you think you have things figured out, something like a Blood Moon will occur and you’ll be flipping out trying to figure out how the zombies all of a sudden know how to open doors. You can mine forever, and the deeper you go, the better the stuff you’ll find (and the more impressive the monsters as well). There are cool magical items that are worth searching for (like a magic mirror that will return you to your spawn point, a definite plus when you are way underground). The game doesn’t hold your hand at all, but if you play around with it you’ll find tons of weapons and items, and even things like chandeliers for your living room. It is the ultimate unending game, and an instant favorite in our house. 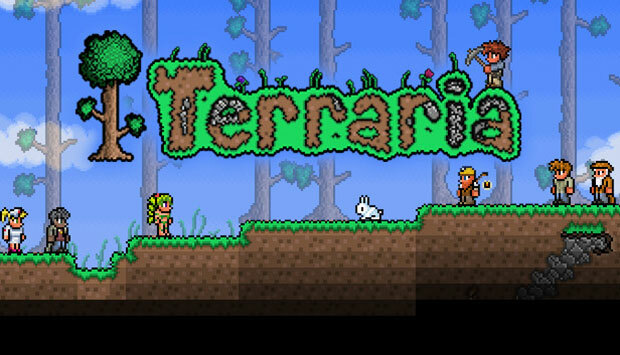 I’ve made no secret of the fact that I live in a house full of Minecraft junkies, and I was very curious to see how they reacted to Terraria. From the very minute they began the game, they were hooked – and so were all the friends who often come over to work on the Minecraft worlds. Up to four players can play at a time, which is a lot of help for tough times like boss battles. Plus, everything is more fun when you can share it with friends, Terraria included. 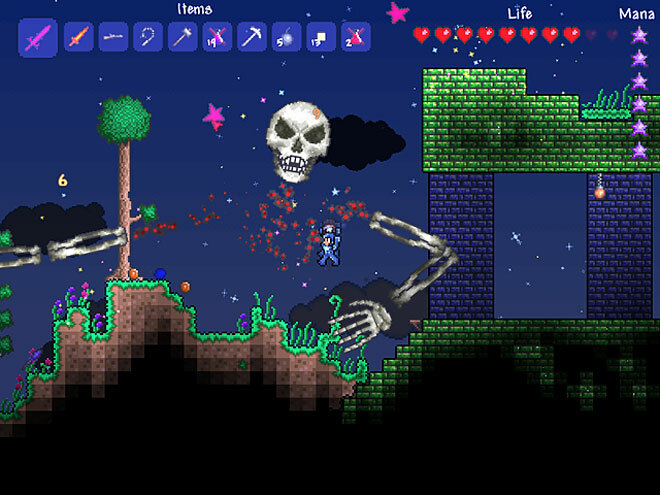 Terraria is an instantly addicting mining, building, crafting, adventuring, exploring – well, you get the point. There is so much to do in this game, and so many places to do it in. It’s loads of fun, and I highly recommend it.